Pink Bunkadoo: Every Cat has Her Night! Every Cat has Her Night! 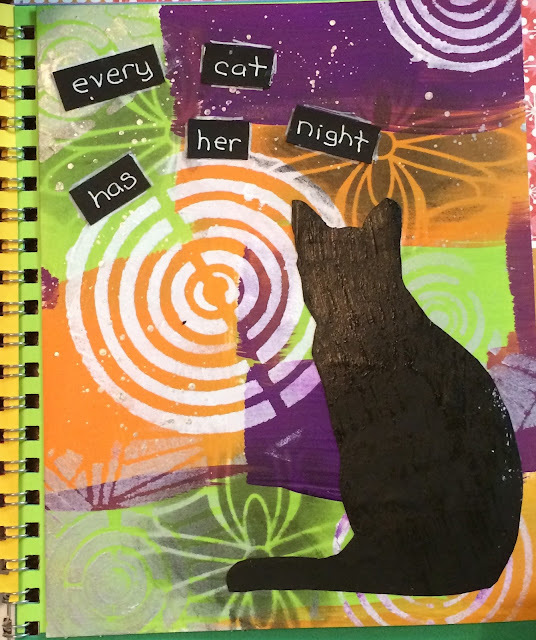 The title of this post is the title of my art journal page inspired be my neurotic, silly, affectionate black kitty Rumer. It's part of the Dina Wakely Media Tribe Challenge. This is a Facebook group of the most creative and encouraging people headed up by our scout leader Dina Speed Wakely. To find out about the group click here. To find out more about Dina, click here. I was planning on using the cat as a mask and paint the rest black. That way the kitty would be neon. I still mght try it. You know how bossy cats can be, right? So this happened instead. As soon as I had a black cat like Rumer on there, the quote popped in my head. And then the whole page came together in a happy color explosion! Here's my process video to see how this was created. This is part of my altered paper sample book series here and on Instagram. You can find me on Instagram by searching for Pink Bunkdadoo. Imagine that! Have you created an art journal page that took a different path then the one you planned. I'd like to hear about it. Materials: Most of my materials either come from Pink Bunkadoo or Amazon because I live in the sticks. Affiliate links don't cost you.